Once A Regional Stabilizer, Saudi Arabia Becomes A Disrupter Saudia Arabia has long seen its role as keeping the turbulent Gulf region steady and calm. But under Crown Prince Mohammed bin Salman, the kingdom has become far more aggressive. 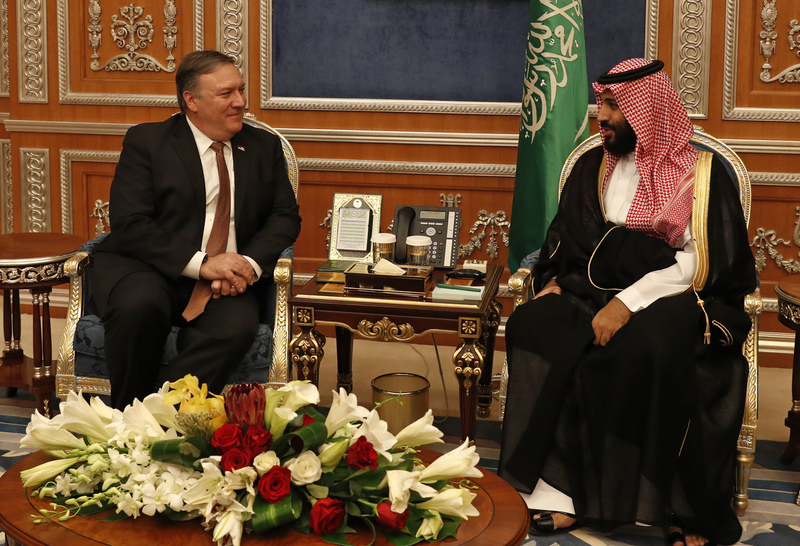 Secretary of State Mike Pompeo meets Tuesday with Saudi Arabia's Crown Prince Mohammed bin Salman in the capital Riyadh. They discussed the disappearance of Saudi journalist Jamal Khashoggi, who vanished two weeks ago during a visit to the Saudi Consulate in Istanbul, Turkey. "Mohammed bin Salman has demonstrated a recklessness and impulsiveness in decision making that has been very costly to the kingdom," said Bruce Riedel of the Brookings Institution, who keeps a close watch on the kingdom. The crown prince is just 33. He rose to prominence three years ago, when his father, King Salman bin Abdul-Aziz Al Saud, now 82, became the most recent of seven brothers to assume the Saudi throne. "He might not have a sense of the limits of Saudi power"
While the king is officially in charge, the crown prince is universally seen as the driving force behind Saudi policies in the past few years. The Saudis are waging an inconclusive war in Yemen. They joined with several allies to blockade their neighbor Qatar, an extremely wealthy emirate that has comfortably handled the isolation. The Saudi held the Lebanese prime minister and forced him to announce his resignation, which he rescinded after he left. And now the kingdom is under intense scrutiny for the disappearance of journalist Jamal Khashoggi. "I think the difference between Mohammed bin Salman and his uncles who ruled Saudi Arabia previously is that he might not have a sense of the limits of Saudi power," said Gregory Gause, a professor at Texas A&M University and an expert on the kingdom. He says many of these recent episodes raise questions about the crown prince's judgment. "He doesn't appreciate the second- and third-order consequences and risks of some of these actions that he's taken," said Gause. Shortly after Mohammed was named defense minister in 2015, he pressed for a Saudi bombing campaign in Yemen, where the U.S. provides weapons, intelligence and other support against Houthi rebels. But the war has become a military stalemate and a humanitarian catastrophe. U.S.-Saudi ties, which date to World War II, have often been bumpy. "The U.S.-Saudi relationship has always been about interests and not values," said Jon Alterman of the Center for Strategic and International Studies. When it comes to democracy, a free press and human rights, the two countries have never had much in common. But shared interests include a steady flow of oil in world markets, countering an expansive Iran and keeping the Gulf calm. "U.S. presidents have come to understand that a lot of things in the Middle East and around the world are much easier to do with the Saudis on board, and much more difficult if the Saudis are fighting you," said Alterman. Saudi policy is often driven by its relentless battle with Iran for preeminence in the region. But before Mohammed, the Saudis tended to rely on diplomacy and their financial clout. The crown prince has taken a much more confrontational approach, said Gause. "He sees Iran kind of throwing its weight around in the region, and I think he says, 'Why can't Saudi Arabia do that?'" said Gause. "Well, I think that Saudi Arabia hasn't been able to do it successfully." President Trump made his first foreign trip as president to Saudi Arabia, and he's a staunch supporter of the kingdom. This may have encouraged the Saudis to be more aggressive. But the international outcry over the disappearance of Khashoggi may change the equation, said Riedel. "The Khashoggi affair has now really raised a Pandora's box for the administration," said Riedel. "The Congress and the American media are not going to let the Khashoggi affair just go away."